The barcode scanner zone and self-service cashier counter. Items displayed on the shelves of the cashier-less store. As a result of the advancement in artificial intelligence technology, many companies are pursuing business ventures in cashier-less stores, which feature self-service checkout systems. Despite one optimistic store operator expressing confidence in the emerging business model, experts question its ability to drive profit. More and more Chinese consumers are beginning to embrace a brand new retail experience. As a consequence of the advancement in artificial intelligence (AI) technology, consumers are now able to serve themselves without interacting with a cashier. For example, it is now possible to order a cup of espresso by simply paying via facial recognition technology at cashier-less stores. Technology upgrade inherently causes retail upgrade, which explains why there has been an increasing number of cashier-less stores being deployed in Chinese cities recently. On Tuesday, the Global Times asked a local Shanghai resident, surnamed Wu, to share his first-time experience in a cashier-less store, he said that it was "very convenient." Its easy-to-use method of payment is a reflection of this opinion. Customers simply position their items on the barcode scanner zone, wait for the laser beam to identify their purchase, and then pay using a QR code created by popular domestic payment tools WeChat and Alipay. On Tuesday in Shanghai, the Global Times witnessed approximately six customers enter the small-scale BingoBox facility - roughly 15 square meters - within half an hour, with most of them noting that the purchasing process was quite smooth. The BingoBox facility is located near the headquarters of feiniu.com, the e-commerce platform of RT-Mart, in Shanghai. An increasing number of Internet companies in China and abroad are betting on cashier-less convenience stores. BingoBox, a technology company headquartered in Zhongshan, South China's Guangdong Province, is one of the latest. In fact, the company was the innovator of the transparent, cube-shaped self-service convenience store that is starting to pop up across Chinese cities. As of July 5, BingoBox had established eight stores of this kind across Zhongshan and Shanghai. Starting in August 2016, the venture involved a strong strategy that focused on high-end communities within these cities. 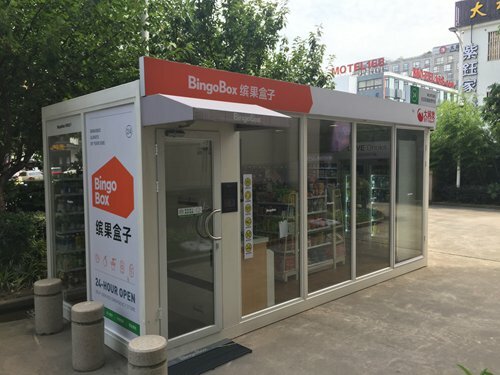 Granted about 100 million yuan ($14.8 million) in its first round of fundraising, BingoBox now plans to deploy 200 cashier-less shops across China by the end of August and to expand into 5,000 shops within the next year, a BingoBox PR representative, who prefers to remain unnamed, told the Global Times on Tuesday. 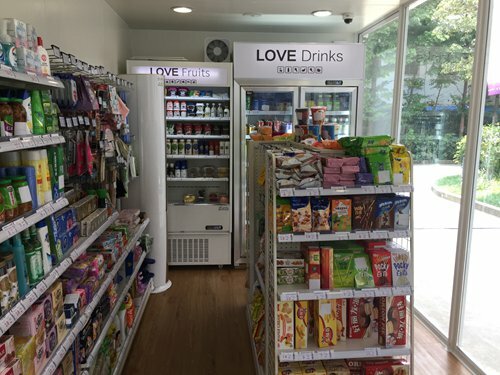 In March, Wheelys Café, a start-up backed by Silicon Valley, introduced its 24-hour cashier-less convenience store to Shanghai after launching its first one in Sweden, according to media reports. Japan's major convenience store chain Lawson is currently in the middle of piloting cashier-less stores in Osaka. The company is aiming to launch it into service soon, China Global Television Network (CGTN), an international media unit of China Central Television, reported on July 11. 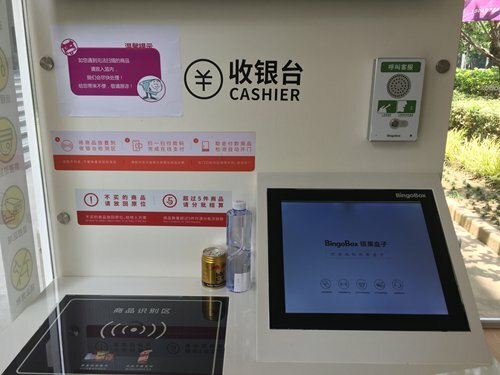 In China, leading beverage company Wahaha, headquartered in Hangzhou, capital of East China's Zhejiang Province, is reportedly planning on opening 100,000 cashier-less convenience stores with integrated AI technologies within the next three years. Chinese e-commerce giant Alibaba Group Holding displayed an unstaffed supermarket during its second annual Taobao Maker Festival in Hangzhou from July 8 to 12. However, there is no specific timetable for the launch of such supermarket yet. According to Wang Xianqing, director of the Institute of Circular Economics at Guangdong University of Finance & Economics, self-service shops may boom in the short term as Alibaba's move to test the waters in return could incite other investors to enter into the sector. Wang told the Global Times Tuesday that retailers are challenged by the need to better connect online and offline sales, which may be encouraging more retailers to open cashier-less stores. Increasing margin pressure is forcing retailers to reassess their staffing models by reducing the number of sales associates. This is expected to be realized via new technologies. "New technologies such as radio frequency identification technology, digital payments, big data and AI" are adopted to change shopping habits as well as to save labor costs, Xiong Gang, chairman and founding partner of Shenzhen-based investment management company China ASB Ventures, told the Global Times on Tuesday. At Tao Café, the checkout-free store showcased by Alibaba during the annual Taobao festival, more than 30 surveillance cameras are used to monitor in-store customers, according to the aforementioned CGTN report. BingoBox said it has implemented smart technologies, such as AI, big data and "Internet of Things," into its business strategy in order to enhance customer service. To do this, the company received 16 world-class patents, including action identification, anti-theft systems, and automatic settlement systems. BingoBox believes that its facility can be profitable after the first month of it being in operation. Xiong noted that cashier-less stores might have more advantages than the regular convenience stores in some first-tier cities where rent and labor costs are relatively high. However, obstructions lay ahead and improvements are needed. "The cost of the cashier-less stores along with the advanced technology is also very high," said Wang, questioning its ability to generate profits. Furthermore, it's still incalculable whether the cashier-less stores can truly bring more convenience to consumers than regular convenience stores, he noted. Xiong agreed, saying that in some small cities, it's hard to say if the operation cost of cashier-less stores is lower than that of the regular stores. "But what is certain is that the cost of the technology and daily maintenance is not low," Xiong noted. One of the facilities run by BingoBox reportedly suspended operation on July 10 due to high temperatures inside the store. The store has now restarted operation after the air conditioning was repaired. This demonstrates one of the limitations of this type of store as there is no staff present to report problems when they initially occur, thus weakening customer experience. Some customers have also complained that counter scanners often fail to recognize the product's barcode, posing another drawback for the business model. "The space is also limited, I'm afraid it can't contain many consumers in rush hour," said Wu, the abovementioned Shanghai resident. BingoBox told the Global Times that it is still at the initial stage of development and that it will beef up efforts in improving management in order to strengthen customer experience. The company said the store with the air conditioning problem was one of their tests. "As investors, we will be cautious toward self-service-related projects," Xiong said.